"Some tools is good. More tools is better." After getting frustrated by the lack of efficiency involved with using only the very basic tools you will find there are more woodworking tools out there to make your work simpler. 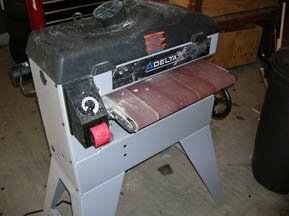 Even if you’ve added a table saw, chop saw, and drill press, we have some suggestions based on tools we use most here at West Hills Wood. To start with, our 12-volt cordless drill is used on virtually every project, large and small. • Pneumatic nail gun Keep in mind that different types of woodworking require specialty tools that don’t cross over to other types of woodworking. For instance, a cabinetmaker will often use 6- or 8-foot clamps to assemble a project. But he’s not likely to find much use for a lathe. If you’re concentrating on wood pens and bowls, the reverse is true. Think about what kind of project appeals to you most. Start there. Make some of those. Get a feel for them. Then target your tool acquisitions toward making the job quicker, less complicated, more interesting. Avoid buying a bunch of tools that will only take up space. Buy the best you can afford, especially since you expect to use it a lot. Quality woodworking tools will last many years. Cheap ones will just make you mad at yourself. You can cuss at it once or cuss at it every time you use it.